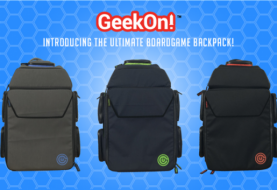 Have No Fear; Ultimate Boardgame Backpack is Here! Twitch’s Insane Total Watch Time in 2018! Console Version of Aggelos Is Coming! Drop us an email for any inquiry! We can also be reached via Our Facebook Page everyday Of the week! GT USA Is All About The Gaming Community, and appreciate our audience. Please Subscribe to our newsletter below, Ring The Bell On The Bottom Right For Notifications, follow us on your favorite social networks, Or Join Our Round Table Forum. Thanks for checking us out fellow Gamers! © GameTraders USA 2018. All rights reserved. Produced by GT USA - Ring The Red Bell To Receive Notifications. No Spam, We Promise!